The World's Columbian Exposition Commemorative Half Dollars are widely accepted as the first U.S. commemorative and the first in the widely collected classic commemorative series. However, some argue that the 1848 CAL. quarter eagles were really the first U.S. commemoratives. 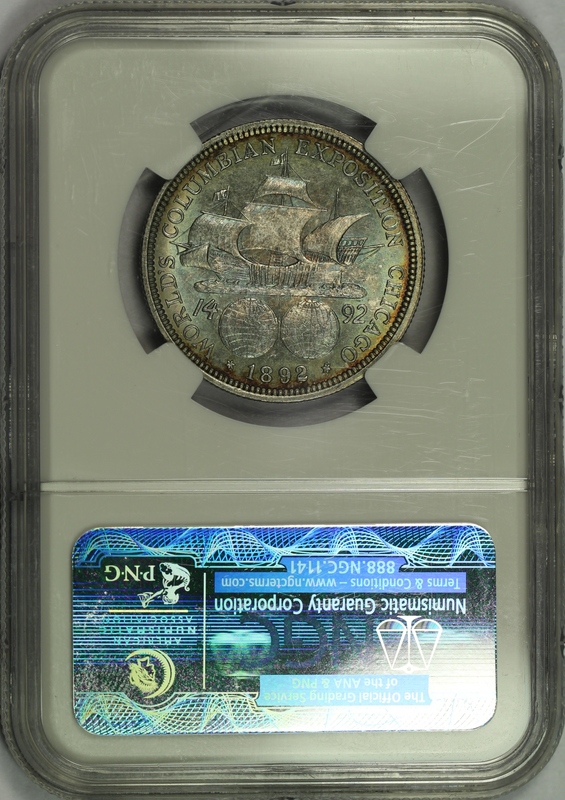 The Columbian Exposition Half Dollars were also the first United States coin of regular issue to depict an actual historical person, Christopher Columbus. The silver used to coin many of the Columbian Half Dollars came from the melting of then uncurrent coins which were pulled from circulation and held by the Treasury, many of which were half dimes last minted in 1873. The Columbian Half Dollars were minted for two years, 1892 and 1893. 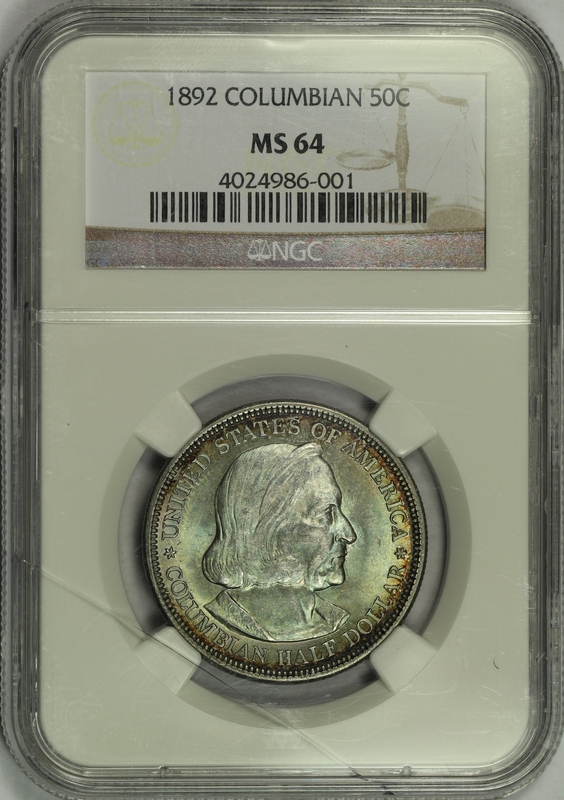 This example is an 1892 Columbian Half Dollar which has been graded MS64 by NGC and is encapsulated in one of their newer-style edge-view holders. The coin is beautifully toned on both sides in a mostly medium sea foam green color that deepens a bit and transitions to other colors near the rims. The coin has nice original luster and relatively few hits or marks. No major distractions are found on the coin and the color and luster give the coin plenty of eye appeal. Please note there is a small crack across the lower left corner of the NGC holder. The crack is mostly cosmetic and slab is still intact with the coin unaffected. 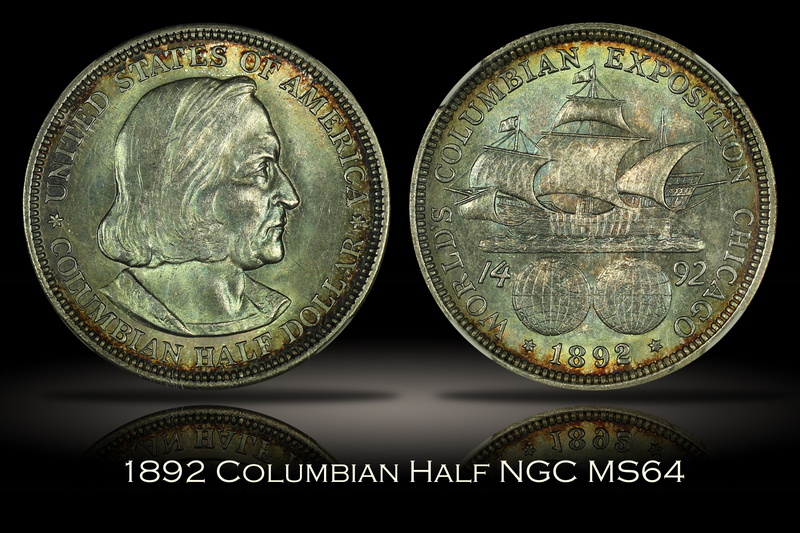 A really pretty example of the classic commemorative Columbian Half Dollar.